We provide opportunities for members, friends, and guests to interact in a large variety of activities designed to strengthen our Christian faith, enrich our friendships, and benefit the whole church family and the wider community. Advent Festival: Soup/bread/dessert supper followed by decorating the sanctuary, crafts, mission packets. Bible Study: Meets in the evening in Fellowship Hall and is listed in the “Epistle” and the Sunday worship bulletin. Birthday Observances: Second Sunday of each month. Our Pastor’s blessings at the end of the service followed by cake in fellowship hour. Choirs: Adult choir practices on Sunday mornings at 8:15 AM in the sanctuary. New singers are always welcome! Choir typically sings from September through most of May. Church School: Sunday mornings at 11:00 AM. Class rooms are in the lower level of the new building. Adult Forum meets in the Community Room (2nd floor, new building). Church School is in session from the Sunday after Labor Day to the end of April. Church Service: Sunday morning at 9:30 AM year-round……in the sanctuary except for special events which are announced. Fellowship: Sunday morning coffee following the service in Fellowship Hall on the lower level. 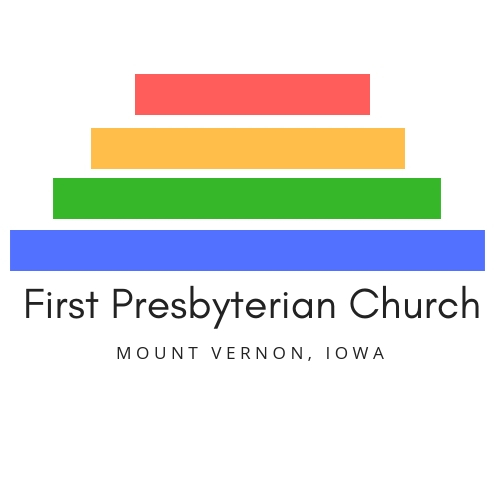 First Pres Auction: Held annually in November, our auction features handmade items, artwork, delicious homemade food, personal services, as well as items donated by local businesses. There is something for everyone! All proceeds support the general fund. Food Booth: Our congregation has a long history of participating in our community events. Whether for Heritage Days, RAGBRAI, or the Fourth of July, we are known for our rhubarb crisp, cinnamon rolls, and specialty brats. Lots of good cooks in the congregation! Knitting Group: Crocheters welcome, too! This group gathers about every six weeks in members’ homes to work on prayer shawls, baby blankets, and caps for infants. Ladies Nite Out: Dinner out for women and guests. Watch the calendar for the next night out! Nursery: The Nursery is located in the lower level of the church, adjacent to Fellowship Hall. Prayer Chain: Year-round. Organized by Member Care Committee. Session: Meets the second Thursday of the month in the Community Room at 6:30 PM. Vacation Bible School: VBS is conducted jointly with the Mt. Vernon Methodist and Seeds of Faith Lutheran Churches. Usually the second or third week in July, Sunday through Thursday evenings.